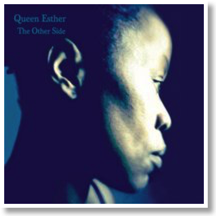 Performer, vocalist, musician, songwriter, and actor Queen Esther is best known for her theater work and jazz excursions, but here her versatility and eclecticism is demonstrated through her love of gospel, classical music, opera, show tunes, and country music. The Other Side’s album cover displays a Billie Holiday-style set against a jazz-blues background with African decorations, but the album tracks counteract this notion; each of the 13 songs is steeped in country and folk music traditions, which is more reminiscent of artists such as Charley Pride and Odetta. “Sunnyland,” the opening track, mines heartland rock spirit (Bruce Springsteen, Tom Pettty), soul-blues vocal styling and the drive of Southern tones. Antique folk and early country permeates “I’ve Come Undone Again,” but with the unusual addition of violin and drums. A sparse but country pop-feel of “Oh Sun” fits snugly with the countrypolitan sound of the late ‘50s and early ‘60s (Skeeter Davis, Eddy Arnold). But there is more than towering old-time musical influences. She tackles the rock outfit Steve Miller Band’s perennial “Jet Airliner,” belting her way through a deep groove. Once-rockabilly singer Wanda Jackson’s “My Big Iron Skillet” is given a fine impression, and Charlie Rich’s “I Feel Like Going Home” is imbued in gospel touches. The Other Side serves its purpose: showcasing an acclaimed performer who gives a subtle message to not judge an album by its cover. There is a lot of meat here, even if the tracks alternate between earlier country music and plaintive folk sounds. Hints of jazz, blues, and gospel bubble about, and the drive and energy in some of the tracks take cues from rock music. Sophistication and authenticity work in tandem to deliver a record that on the surface may seem simple but in reality has a mark of different inspired musical textures that work together. 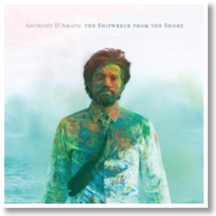 Fans of folk music are in for a treat this summer with the release of Anthony D’Amato’s new album, The Shipwreck From The Shore. A 26 year-old Princeton graduate, D’Amato writes with a sense of youthful buoyancy. His vocal style is reminiscent of Ben Kweller or Ben Folds, two contemporary giants in the folk scene. The simple melodies combined with the soothing quality of D’Amato’s voice make for a pleasant listening experience. Even the more unsettling songs have a lightness about them. “Good And Ready” is based around the lyrics, “I don’t want to wake up / If it ain’t next to you.” It is a sweet sentiment, but one of the first lines of the song is, “Let me die in my sleep / When I’m good and ready.” Ordinarily this kind of language would elicit a dark emotional response. However, the song’s steady, upbeat feel puts the audience at ease. Standard harmonies give the song a sense of familiarity and groundedness, further diverting the listener’s attention from the weight of the text. Though the album largely conforms to the “folk mold,” D’Amato shows more originality in his song “Ludlow.” The piece begins with a brief introduction featuring a duet for clarinet and acoustic guitar. The clarinet sings a sweet, meandering melody reminiscent of a movie score. The lyrics depart from the more formulaic texts in the album. After the clarinet and guitar do their dance, D’Amato comes in with, “First the whisper, then the shout / First the temple, then the doubt.” This piece brings a unique poetic element, which is lacking in the other songs. “Ludlow” does not deviate from D’Amato’s typical peaceful ambiance. However, the song possesses a more deliberate intention than many of the other songs. The vocals interact beautifully with the instruments, particularly with the clarinet. The hollow quality of the instrument mirrors and heightens the effect of D’Amato’s voice, jointly and effectively conveying a compelling message. 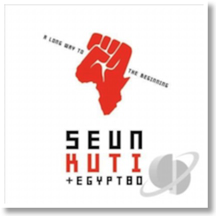 Seun Kuti (Oluseun Anikulapo Kuti), the youngest son of Afrobeat pioneer and innovator Fela Kuti, has released A Long Way To the Beginning with some members of his father's legendary band, Egypt 80. Steeped in rhythm & blues saxophones, Afro jazz-funk rhythms, and vibrancy associated with spiritual uplift and robust messages, Kuti sustains his father’s tales and philosophies of corrupt leaders, suffering nations, and the need to maintain freedom, self-determination, and peace. Mined by expansive grooves, jazz improvisation, and lyrical clout, Seun Kuti creates a striking manifesto that aims to reach the global audience. Themes of affliction, animosity, and anti-corruption abound, calling for change in celebratory grooves that are equally potent. A Long Way To the Beginning is a masterwork in Afrobeat music.